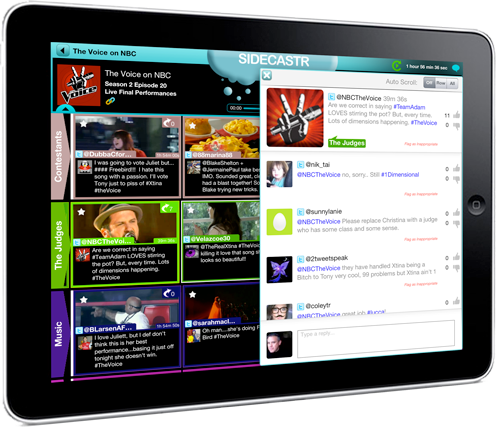 Sidecastr for iPad™ is the ultimate ‘whenever and however’ you watch TV companion app for scene-synchronized enjoyment of high quality social comments tweeted by fans, friends, and celebrities, filtered in from the live stream by superfans covering each new episode. Not watching live? Staying away from social media to avoid spoilers? Sidecastr has your back. Our patent-pending audio detection seamlessly keeps comments in constant sync with whatever you’re watching on your primary TV screen, whether you’re live, a few minutes delayed, or streaming a rental to your laptop years later. You even stay in sync when you skip forward, jump back or change episodes. © 2013 Sidecastr, Inc. All Rights Reserved.